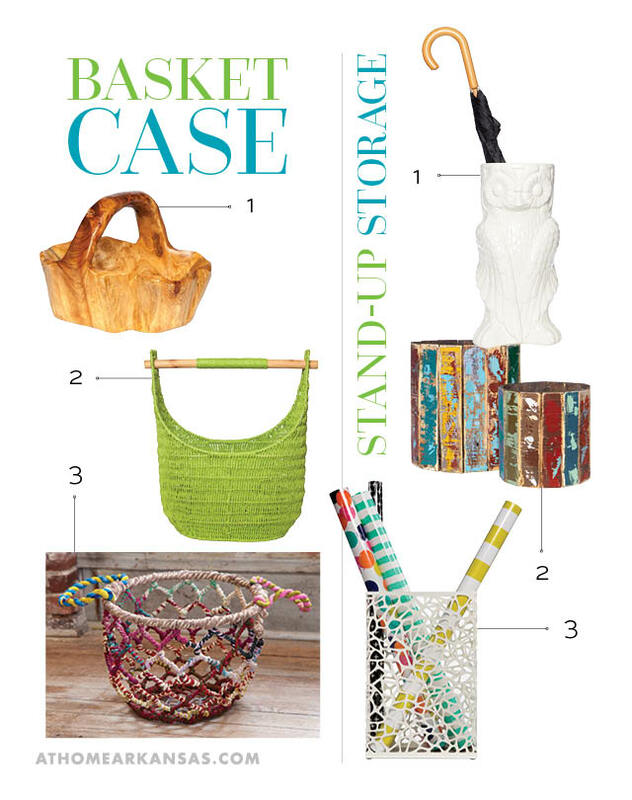 Your entryway or mud room doesn’t have to be an afterthought. Organize your mail and necessities in baskets, small dishes, and easy-to-reach cubby holes; a pet bed tucked out of the way makes the perfect spot for your pooch. Romance Diamond, Fayetteville, (479) 443-9289, romancediamond.com. Clothing provided by BEIGE. Less mess means less stress! 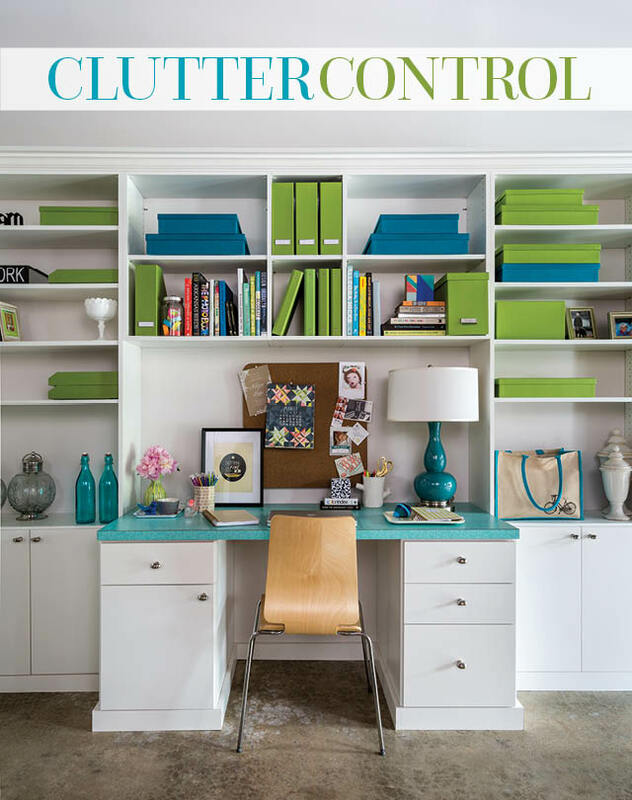 Put clutter in its place with these attractive organization solutions. Custom-designed home office. Closet Factory, Little Rock, (501) 907-7105, closetfactory.com Blue and green storage boxes. The Container Store, Little Rock, (501) 660-7828, containerstore.com Photographed on location at Closet Factory’s Little Rock showroom. 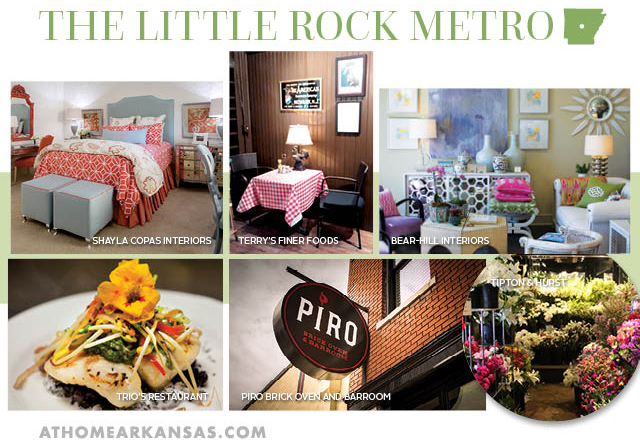 If you haven’t been out and about in the Little Rock metro area recently, you’re missing out! 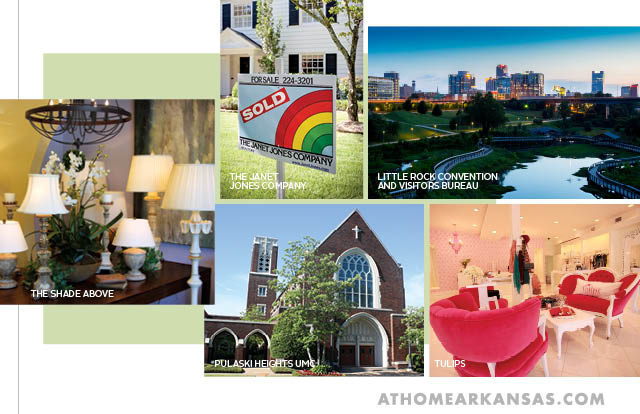 From delicious dining establishments to well-stocked décor and clothing boutiques, interior design professionals, and home renovation stores, the capital city has everything you could want or need—all within close proximity. Follow along as we stop at a few of our favorite venues in downtown Little Rock, as well as the Heights, Hillcrest, Midtown, and Riverdale neighborhoods. If you have lived in or visited Little Rock, you’re likely familiar with Trio’s Restaurant (501-221-3330, triosrestaurant.com). This charming establishment, which is located in Pavilion in the Park, began in 1986 as a gourmet shop and has since grown into an award-winning restaurant and a local institution. Featuring fresh, healthful, and often locally grown, organic foods, the menu at Trio’s never disappoints. Our personal favorite from the lunch menu is the Peck’s Salad. 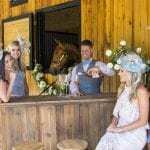 In addition to their daily offerings, they also provide catering and private dining services. For dinner, try one of the newest additions to the SoMa area, which also happens to be one of the tastiest. Piro Brick Oven and Barroom (501-374-7476, pirolr.com) offers house-made pizzas, salads, sandwiches, and artisan cocktails. If it’s a gourmet pizza you’re craving, we suggest the H.A.M.Cetta, which includes pancetta, smoked chiles, pecorino, and arugula topped with a farm-fresh fried egg. What’s more, the inviting lounge and bar areas are the perfect spot to unwind at the end of the workday while sipping on a Tequilla Mockingbird or an Apple Angel. If you’re looking for fare that’s equally quick and delicious, visit another Little Rock staple, Terry’s Finer Foods (501-663-4152), which now has an informal setting known as The Grill at Terry’s. This space will soon feature a hot buffet that will be available Monday-Saturday, from 11 a.m. until 6 p.m. In addition, you can still shop their gourmet grocery selection and enjoy fine French cuisine at The Restaurant. If you purchase a new home, you may be in need of interior design services to personalize your space. Turn to Shayla Copas of Shayla Copas Interiors (501-258-7396, shaylacopas.com) for any project—interior or exterior, large or small. With years of design experience, she can help you to order a few new pieces of furniture or complete a full renovation. Copas also does event design for celebrations of any size. She recently designed the Governor’s Ball for Arkansas Governor Asa Hutchinson. When you are ready to get out and about, start your shopping trip along Rebsamen Park Road where you’ll find an abundance of well-appointed design shops, including Bear-Hill Interiors (501-907-9272, bearhillinteriors.com). Step inside and you’ll find yourself in a chic, sophisticated, and airy inspiration haven. Shop their Murano glass, exquisite lamps, cosmopolitan furnishings, and an amazing selection of art, accents, and gifts. We love the color-coordinated lifestyle vignettes set up around the shop in colors from soft pink to turquoise blue to monochromatic neutrals. While you’re there, find out how to get the look in your own home by inquiring about their interior design services from Kevin Walsh and Susan Walsh. 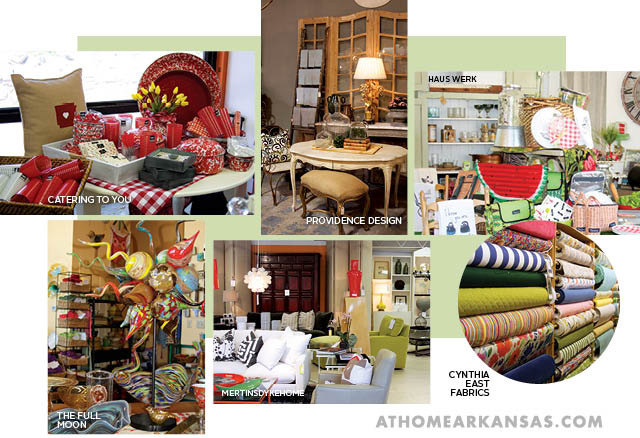 Just next door, you’ll find mertinsdykehome (501-280-3200, mertinsdykehome.com), a store known for contemporary, sleek, and comfortable furnishings including the highly sought-after American Leather line. If you’re in the market for a new sofa, they have every style and upholstery option imaginable. 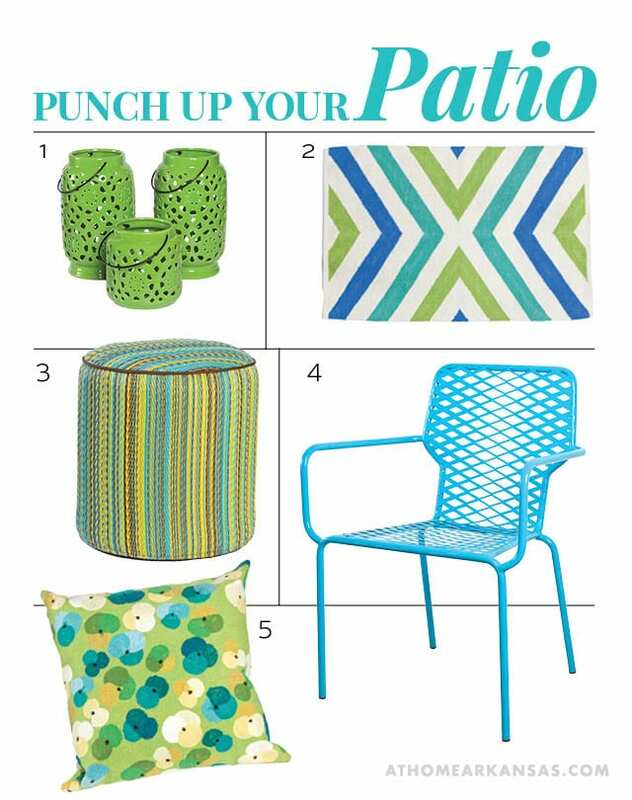 In addition, you’ll find a large selection of complementary accessories and accent pieces to complete your look. Designer Garry Mertins and the rest of the friendly staff can assist you in making your home equal parts polished and relaxing. While you’re in the Riverdale area, be sure to visit Debi Davis Interior Design (501-221-2032, danddinteriordesign.com). You’ll fall in love with their European and Old World-inspired furnishings in the showroom, including pieces from Davis’s signature Reborn Relics line. If you want to get the elegance-meets-simplicity look in your own home, consult with Debi and her team on your renovation or interior refresh. 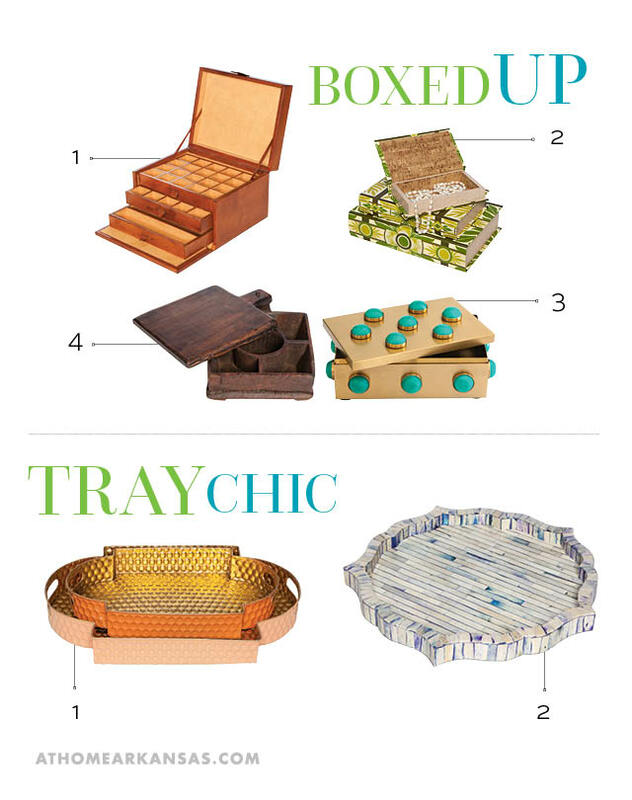 If you’re looking to unearth a treasure, the two-sister design team of Talena Ray and Mona Thompson at Providence Design (501-372-1886, providenceltddesign.com) can save you the trouble. The designing duo is always on the hunt for a one-of-a-kind piece that will stand out and make your space truly remarkable. They also offer full-service design for new construction and home remodels. Their soft, modern and European-influenced style, which also features strong architectural elements, has become a hit with clients in Arkansas and around the region. Heading out of the Riverdale District and down Cantrell Road, you’ll find a bevy of design and home décor shops and clothing boutiques in the walkable Heights neighborhood. 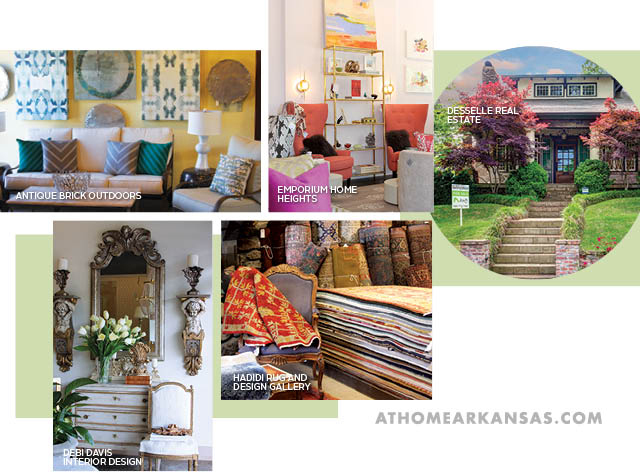 One of the newest shops, Emporium Home Heights (501-313-2418, emporiumhome.com), carries the full line of Emporium Home by Ashley Childers, a parade of colorful, eye-catching furnishings, lighting, and accessories. We love browsing their wide array of gifts and home décor items, including throws. Be sure to watch for their art and trunk shows as well. 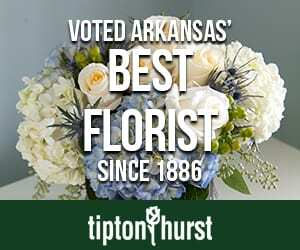 Just around the corner on North Grant, you’ll find Tipton & Hurst (501-666-3333, tiptonhurst.com). Known for their endless selection of flowers and as a long-established floral design company, they also offer a huge selection of cache pots, vases, and containers. If you’re not in the market for florals, turn to them for a quick gift item or a thoughtful memento for a dear friend. From decorative pieces and frames to candles and art, Tipton & Hurst truly has the details that will make your house a home. Next, we suggest heading to Hillcrest, where you’ll find The Full Moon (501-663-4367, thefullmoonlittlerock.com). 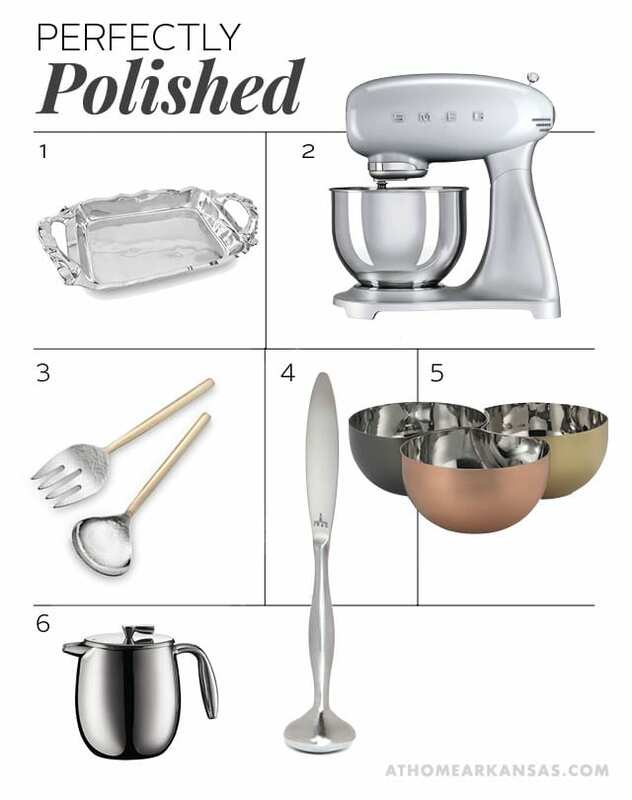 Long loved by brides-to-be, they offer a full-service bridal registry with lines such as Juliska, Vietri, and McCarty’s Pottery. 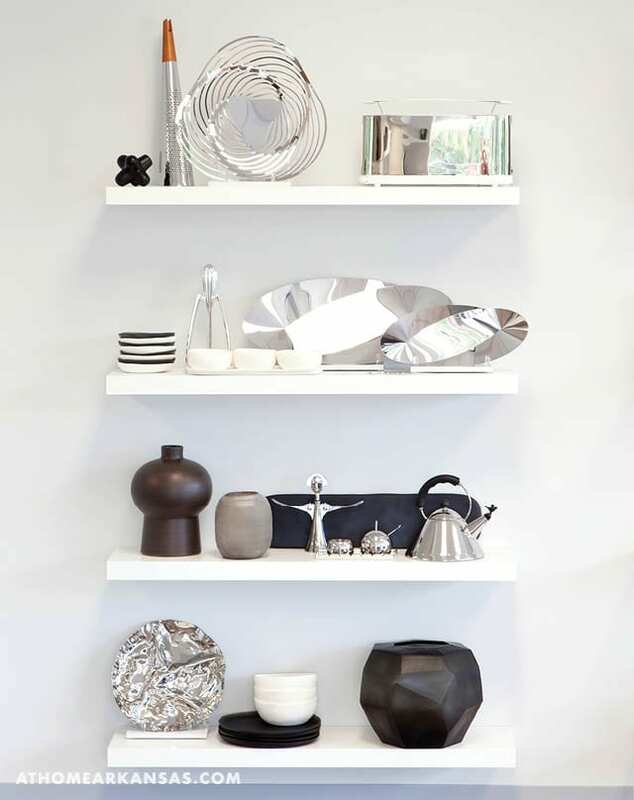 Drop in to pick up a thoughtful gift or browse their colorful selection of home wares and jewelry. In addition to the gift items and serving pieces, they also carry Arkansas art glass, produced locally by Pine Bluff artist James Hayes. Continuing down Kavanaugh Boulevard, make a stop at Haus Werk (501-663-5251, shophauswerk.com) where you’ll be delighted by the stylish and eclectic clothing and furnishings options. There’s truly something for every room and every style. From tableware for your next gathering to a welcome sign for your lake house, the shop is stocked with a range of options. We love their fun and wearable, comfortable clothing for women as well as their great selection of artisan jewelry, scarves, and shoes. Returning to Cantrell Road and heading west, drop in to Catering to You (501-614-9030, cateringtoyouinlittlerock.com) for their fresh-made daily specials that are ready to eat or choose from their pre-packaged, oven-ready meals. From salads and appetizers to entrees and desserts, Catering to You can cover your entire menu. While you’re there, check out their unique gift items, paper products, and serving and decorative wares. You’ll even find a special section for seasonal decorations and infant and children’s clothing. It’s truly a gem for picking up dinner and a gift for a friend or a weeknight meal for your own family. Featuring bolt upon bolt of in-stock fabric, you can walk into Cynthia East Fabrics (501-663-0460, cynthiaeastfabrics.com), find a favorite pattern, and leave with everything you need for your next project. In addition to these readily available textiles, they also have a large selection of special order fabrics. If you’re short on time, shop their ready-made draperies and pillows. 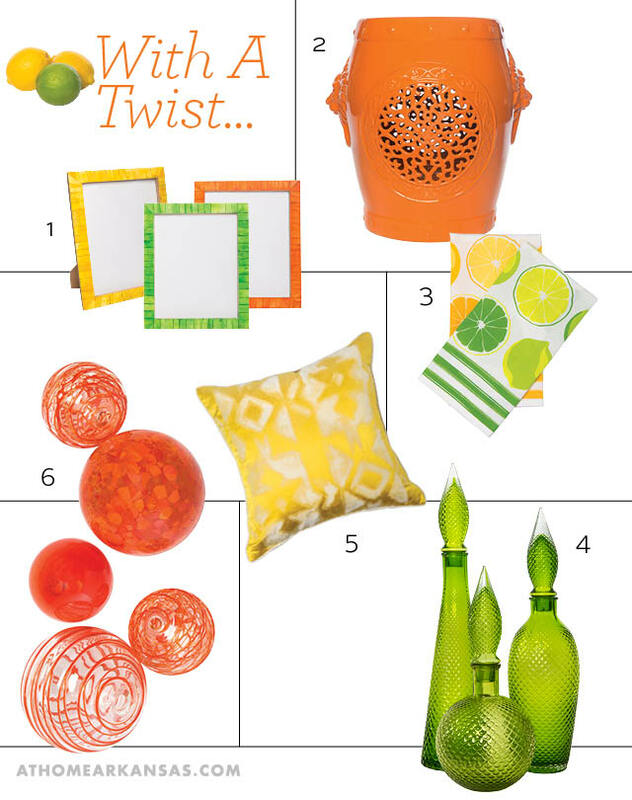 They also offer colorful gift items and home wares. 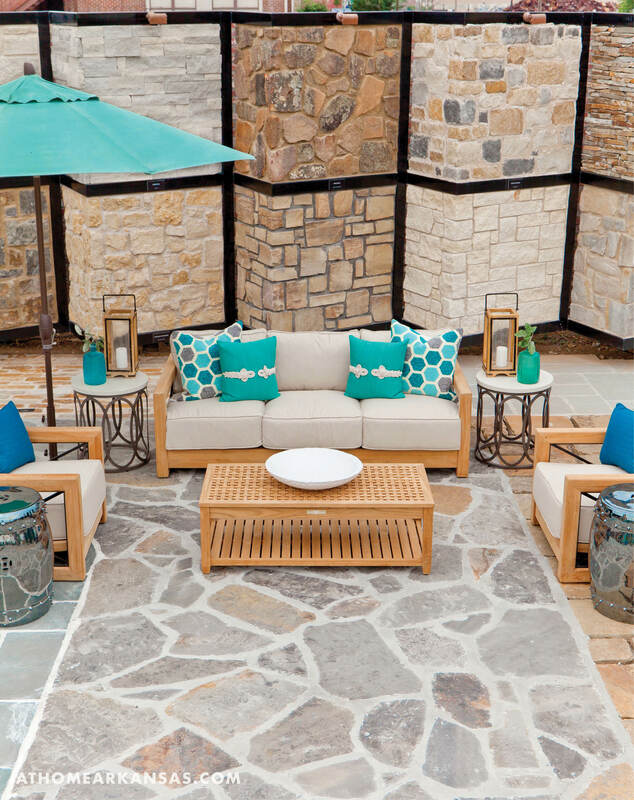 If you’re in the market for new outdoor furnishings, head to Antique Brick Outdoors (501-375-0060, antiquebrickoutdoors.com), where you’ll find quality brands such as Summer Classics, New River, Mallin and more. Their helpful staff can assist you in finding a comfortable dining set or lounger and coordinating outdoor-friendly throw pillows and accessories. You’ll also find culinary lines such as FireMagic, American Outdoor Grill, and TRUE Refrigeration, to make your dream of a fully functional outdoor kitchen a reality. 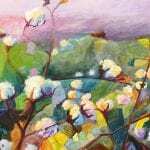 Conveniently located on Cantrell Road, Hadidi Rug and Design Gallery (501-225-8999, hadidiruggallery.com) is known for having one of the state’s largest varieties of handmade rugs from around the world. The selection, which is comprised of new, semi-antique, and antique rugs, boasts a range of hues and patterns from popular modern and French design to traditional motifs that have stood the test of time. In addition, they also offer rug storage, cleaning, and repair. 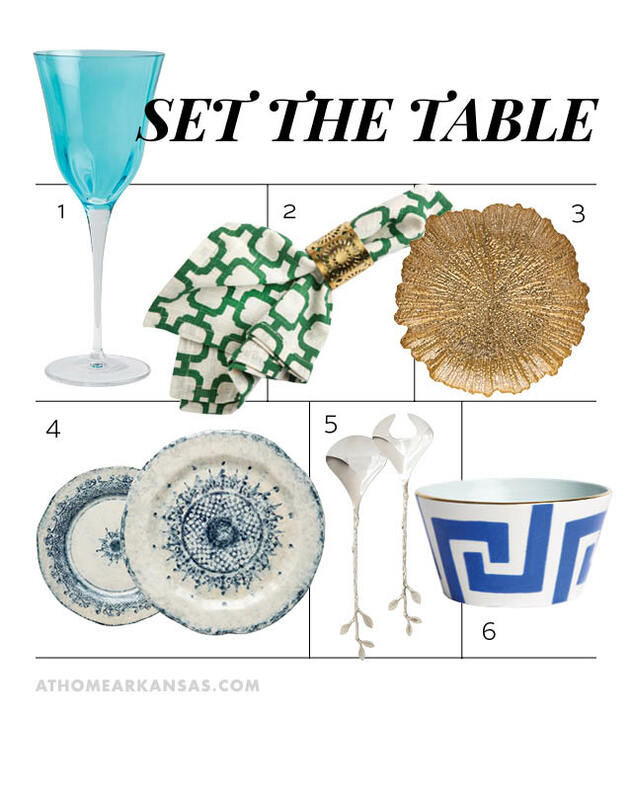 For all things lamp-related—from repair to custom shades, The Shade Above (501-374-3555, theshadeabove.com) is Little Rock’s prime destination. 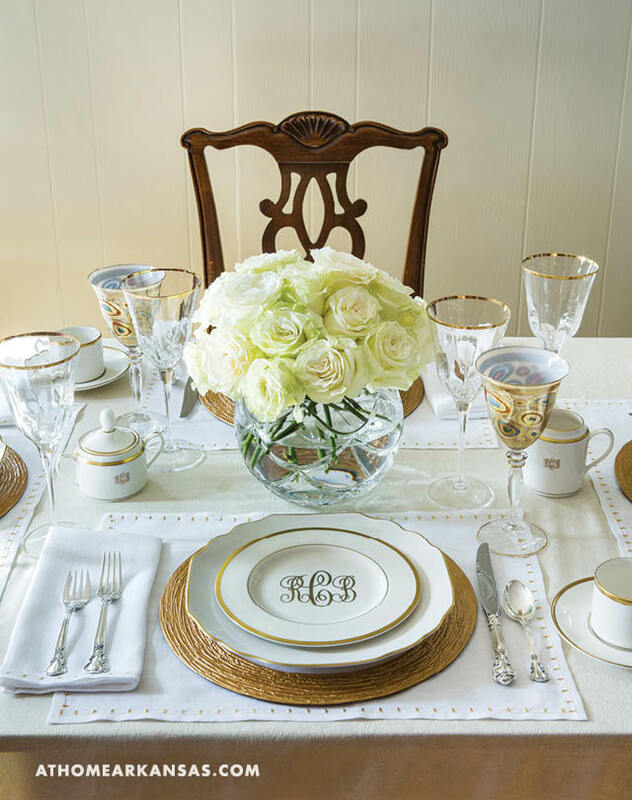 Order custom silk lampshades with trimming, pleating, and/or monogramming. Bring in your antique lamps and chandeliers for restoration, or find replacement shades to update worn or dated pieces. You’ll find a wide selection of shades and lamp bases in stock, but if you can’t find exactly what you are looking for, they’ll be happy to make your ideal shade to custom specifications. 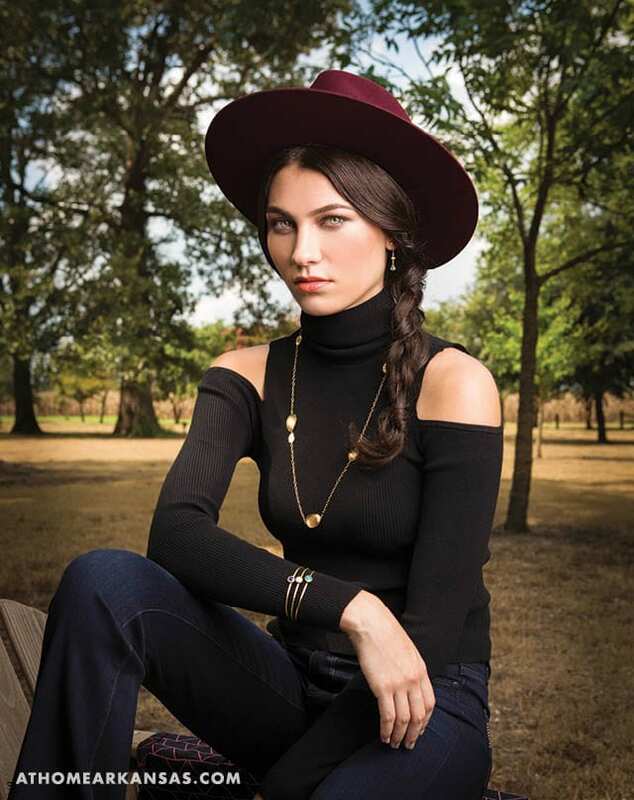 If you’re on the hunt for a new outfit for a casual weekend get-together or a special occasion, turn to one of Little Rock’s most stylish and trusted shops, Tulips (501-614-7343, tulipsarkansas.com). A boutique for the fun-loving, well-dressed woman, Tulips carries all the latest trends. You’ll find everyday staples alongside inspired new designers such as Britt Ryan. For more than 12 years, owner Emily Brown has brought the best of the fashion world to this cute-as-can-be shop in the Heights. If you’re ready to make Little Rock home, or if you’re looking to move to a new neighborhood within the city, contact Susan Desselle and her team at Desselle Real Estate (501-772-7100, dessellerealestate.com). With a clear understanding of the local market, Susan is recognized annually as a diamond-level producer by the Arkansas Realtors Association. Let her or one of her knowledgeable team members use their full-service, outside-the-box approach to sell your current home or find your new dream home. Call on The Janet Jones Company (501-224-3201, janetjones.com) for a locally owned realty team that prides itself on “legendary service.” With a team of agents and 30 years of experience as an agency, they look to help their clients make informed decisions about their residences. No matter if you’re in the market for a downtown condo, a suburban home, or a cabin on the outskirts of town, the team at Janet Jones knows every inch of the local landscape. Whether you’re new to the area or a long-time resident, Pulaski Heights United Methodist Church (501-664-3600, phumc.com) looks to welcome you with open arms. Located in the heart of the Hillcrest community, join them for worship on Sundays or contact them to inquire about their outstanding Children’s Learning Center, which offers day school for children six weeks through three years of age as well as after-school care for children in Pre-K through 5th grade. When it’s time to kick back and have some good, old-fashioned fun in the capital city, the Little Rock Convention and Vistors Bureau (501-376-4781, littlerock.com) is a source for a wide variety of activities for every age group and interest. This July, they’re excited to welcome PBS’s long-running “Antiques Road Show” to town. This ticketed event, which will take place on July 25 at the Statehouse Convention Center, offers guests the opportunity to have heirlooms, flea-market finds, and other vintage items appraised.